The feeling that springs up when looking out over the sea of games currently scheduled to land in 2018 is uncertainty. Uncertainty because some of its heaviest hitters, like God Of War and Monster Hunter: World, are ambitious reimaginings of well-established series. Uncertainty because Electronic Arts’ year-long meltdown is sure to have huge, unseen consequences on its biggest launch of the year, Anthem. Uncertainty because, less than six months from release, we still have little idea what Red Dead Redemption 2 is and how the massive success of Grand Theft Auto Online might affect Rockstar’s approach to balancing a money-making multiplayer mode with the rich Western narrative players expect. Uncertainty because, hell, Nintendo has barely announced any games for 2018 so far. 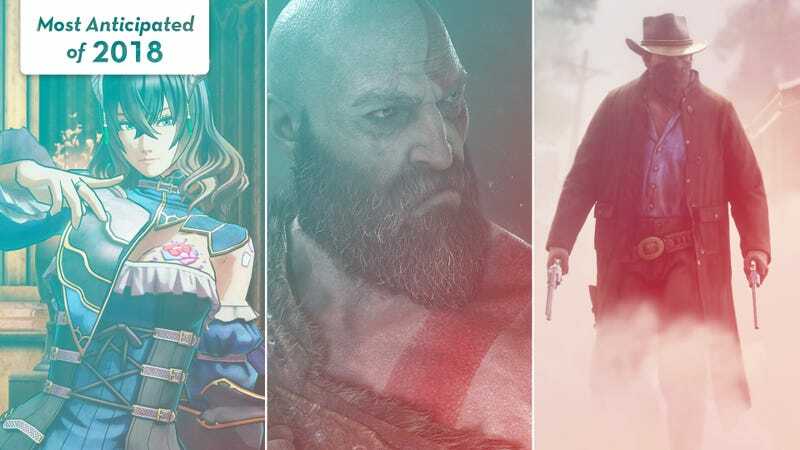 Despite those questions, and the fog surrounding what is surely a huge number of games yet to be announced, there are a ton of intriguing projects already lined up for the year. So many, in fact, that cutting the release calendar down to a manageable list of the most-promising, or at least most-interesting, morsels was a hell of a task, but cut we did. These are the 20 games we’re most looking forward to getting our hands on in 2018.